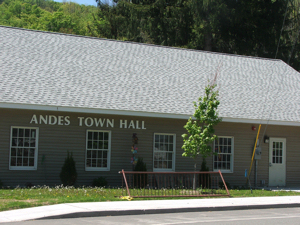 At the Town Council meeting on Tuesday, September 12th, the Board heard from Tara Donadio about grants available from NYSERDA to help towns reduce costs and energy use. Ms. Donadio works for the Cornell Cooperative Extension as Energy Educator and Clean Energy Community Coordinator. The Town Board showed such immediate interest and approval (“real doable” said one Board member) that they passed 2 resolutions on the spot. The first, called “benchmarking,” creates a report of all energy use by Andes municipal buildings to be available for supporting grant applications. The second streamlines the permit process for the installation of solar panels on private dwellings so that they are no more cumbersome or expensive than any other building permit.